Karate is not for everyone. After all these years teaching I still don’t get that. However, I’ve seen lots of kids come to the dojo for just a few classes never to return. Am I a bad teacher or is just that karate isn’t for everyone? Or, are we just raising a nation of quitters? Kids who will grow to be adults who will ultimately give up when they don’t like something or when it gets difficult, kids who don’t understand that you have to work and practice to acquire new skills. Here’s the scenario: After watching Kung Foo Panda one night, little Billy starts talking about joining karate. You start calling around and searching the internet for a class you can fit in to your already packed schedule and that you can afford. You find a class for Billy to attend and shell out the cash to register him, purchase his uniform and pay for his first month. Kung Foo Panda just cost you $100! Billy can’t start his classes until the first of the month so you spend two weeks waiting and listening to him talk excitedly about his karate class. He marks off days on the calendar until he goes to his first class. The big day arrives and Billy is ready to leave and hour before class starts. Homework & chores are done. He looks cute as can be in his new karate uniform. He’s not sure he tied his white belt right but it’s only a small part of karate. You walk in the door and suddenly Billy is quieter than normal, he’s staying pretty close to you. The other kids start lining up for class. An older boy shows Billy how to bow in and lines him up at the end of the line, in the back row. Not at all how he imagined it. Sensei helps Billy tie his belt, that crazy knot he had just won’t do. Warm ups start. Billy gets out breath pretty fast. Stretches start. Billy seems a little confused. He can touch his toes, what is all this for? Then the hand techniques start. Billy doesn’t seem to know left from right and the Sensei frequently tells him to switch hands. Sensei shows Billy how to do a couple different kicks. He falls a couple times but gets back up and finishes class. 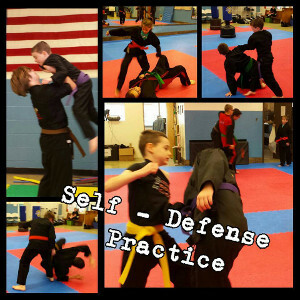 Sensei tells him he did a great job in his first class and assures him that it gets easier the more he practices. Billy is quiet on the ride home. He tells you it was a lot harder then he thought it would be and that he doesn’t understand why he had to do all those things. He just wants to get to the fighting like he saw on TV. Second class is the very similar but at least Billy is talking to a couple of the other kids. By the third class Billy says that karate is just too hard and he’d rather play video games tonight. This is a familiar story, it can relate to any activity a kid tries – soccer, dance, guitar lessons, art class etc. Here’s the thing, not everyone is a natural at the things they want to learn to do. Sometimes, you have to really work at something new in order to learn it. You have to practice and you really have to stink at it (at first anyway). I think we are forgetting to teach this to our kids. Oh, that chapter book has to many big words? OK, read this comic book instead. That math sheet is too hard for you? Let me get you an easier one. Can’t play your favorite song on piano after a month of lessons? You didn’t get your black belt within the first month of karate? OK, walk away from it. We’ll enroll you in something else. No parent wants to see their kids struggle. Childhood is a great time to learn new things though! One of the things we have to teach our kids is that repetition is the key to learning. Keep practicing, and then you will learn it. If you quit because it’s hard you WILL NOT learn the skill. You might miss out on something that could bring you joy for a lifetime just because it was hard when you started it. So, should you force Billy to continue karate for years and earn a black belt? That’s what he wanted, right? That’s not realistic. 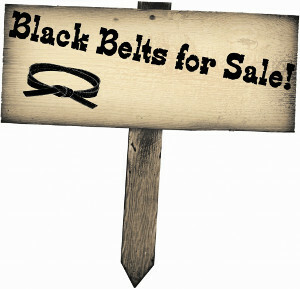 It can take 5 years to earn a black belt. So, set a goal. Tell Billy he has to stick with this to earn his first belt, in our style that’s a yellow belt. Billy will see the proverbial “light at the end of the tunnel”. If he can just learn what he needs to get that elusive yellow belt, then he can get back to his video games. No Comments to "Raising A Nation of Quitters"